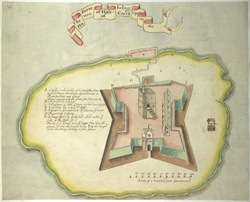 This watercolour shows the fort at Haleboling and dates from around 1611. It is largely pictorial, with the fort occupying a disproportionate area, leaving only a small margin of surrounding land. The key notes that the ‘land is much bigger than here the figure shewes’ and that there is a decline in the hill that the fort is built on. The drawing shows the two platform structure, the soldier’s lodgings, the gunner’s lodgings and a platform for ordnance.